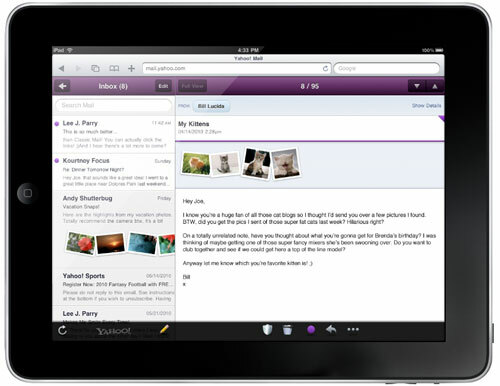 Yahoo Mail recently launched its HTML 5 based version for the iPhone and iPod Touch and now it’s the iPad’s turn. Yahoo Mail product manager Lee Parry announced the news on the official Yahoo Mail blog and explained that the service is similar to the iPhone and iPod Touch version, only optimised for iPad’s larger screen. Now users can access and search their messages even when they’re offline through local caching. You can find and organize your messages using Full Search, Personal Folders and Smart Folders with messages from your most important contacts and optimized views for photos and file attachments are also available. Now it’s also possible to view rich photo attachments in their full form, or as previews directly in the inbox view. Also included is a dual-pane view to make reading and organizing a breeze. This is the first version of the mail service for the iPad and Yahoo promises to improve, update and add new features based on consumer feedback and suggestions. To try it out, open mail.yahoo.com in your iPad’s Safari browser.